Joselyn Agaba, commonly known as Mrs Rwabyoona, the victim in Thursday afternoon foiled robbery in Bweyogerere near Kampala is stable and has been discharged from hospital. A police statement explaining the circumstances under which robbers attacked Agaba and were intercepted as they made off with money they had taken from her, comfirmed that doctors at Gwatiiro Hospital in Bweyogerere have given the businesswoman a clean bill of health. Police on Thursday afternoon shot dead two of the armed thugs after they attempted to rob a businesswoman in broad daylight in Bweyogerere, a suburb in Wakiso District. 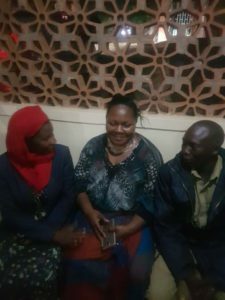 Earlier eye witness accounts implied that the armed robbers, who were riding on a boda boda, attacked Agaba while she was in a car returning from the bank where she had gone to withdraw money to pay off her workers’ salaries. It is said the robbers tried to grab her bag containing the money. However, she resisted, prompting them to stab her in the neck and grab the money. However, police have clarified that the thugs attacked Agaba in her shop at Rwabyoona Plaza, breaking into the counter and grabbed the money. In an attempt to slit her throat, Agaba managed to fight them off and screamed for help, prompting the thugs to run. They hijacked a car belonging to a driving school as they tried to flee the scene . Police say they were informed and followed the thugs towards JOKAS Hotel Stage. The thugs abandoned the car and took boda bodas due to heavy traffic jam. “Our officers in a joint chase together with crime preventers and boda boda riders yielded the much expected success and put them out of action at Industrial Park Namanve during cross fire exchange,” the police statement reads in part, adding that they recovered Shs180,000/=, US Dollars 100, two dagger knives, two hood masks, SMG gun with nine cartridges and two mobile phones. The bodies of the robbers were taken to Mulago mortuary for postmortem according to police. 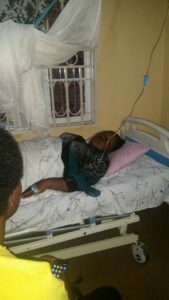 Agaba in hospital after the attack on Thursday.